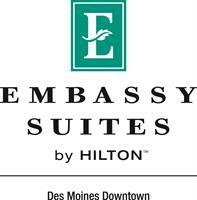 Reserve your 2019 or beyond room block or meeting at Embassy Suites Des Moines Downtown and get rewarded today. Choose one of three options from the following rewards based on booking value: Hilton Honors Points, Visa Gift Cards, or the latest in Technology gifts. Reserve the future and get rewarded today! If we cannot match or improve your rate, YOU will receive a $1,000 Visa® Gift Card! $5 off Swim Lessons at the South Suburban Y!